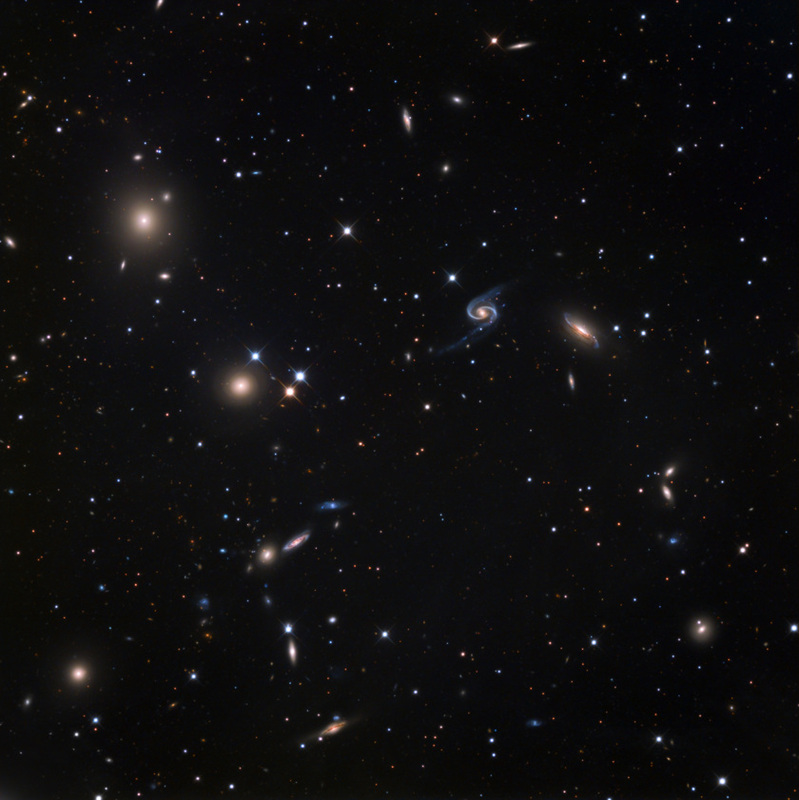 This image of the NGC 90 galactic cluster was taken in October 2014. View additional information. 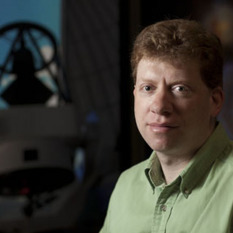 Then consider outside of this field—just a small move—are more, and there are more beyond the reach of this instrument. Perhaps for the first time this field has been captured in color at this depth. Although nothing is countless here- it sure feels pretty close. Of course, you *must* click on the image to enlarge to appreciate what is hidden in this field. The Helix Nebula is a nearby dying star whose fate perhaps mirrors our own sun many billions of years from now. 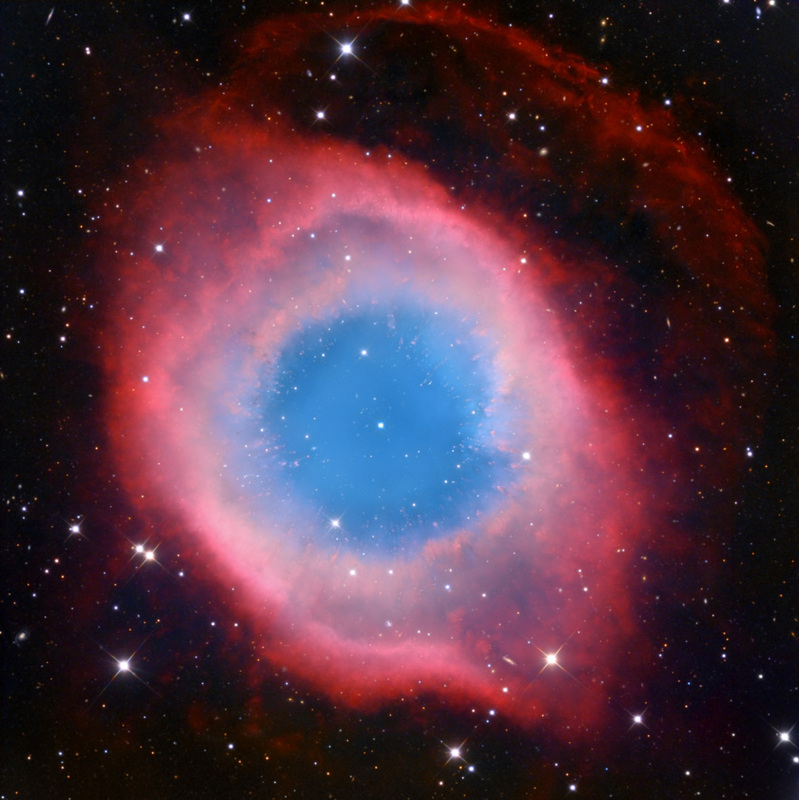 This view of the Helix Nebula was acquired in September and October 2014. View additional information. 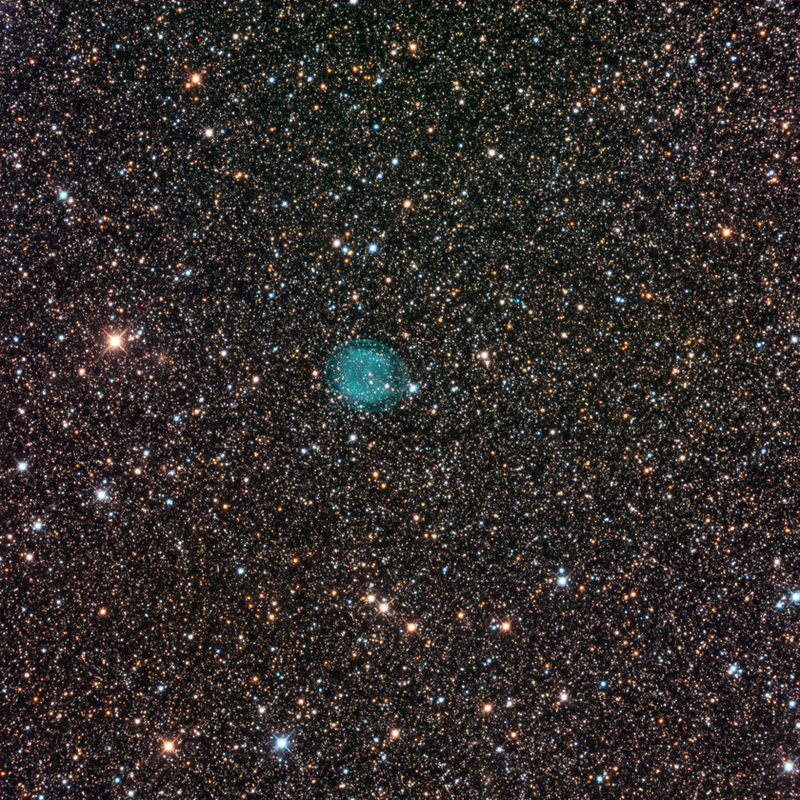 IC 1295 is a planetary nebula 3300 light-years away, in the constellation Scutum. This view was acquired in June and July 2014. View additional information. Technical note: This could be one of the deepest images of this nebula ever taken using broadband (full color) filters. There exists a beautiful rendition of this nebula taken by ESO's VLT 8 meter telescope (ten times the size of the one I used) last year. However, their filter set does not sample the OIII emission (color) as having a blue component since the OIII line falls much more in the V filter. Whereas using the filter set at the 0.8m Schulman Telescope we capture the overlap of the green and blue color of this nebula better and render it closer to what eyeballs would see if it were brighter (which it isn't!). 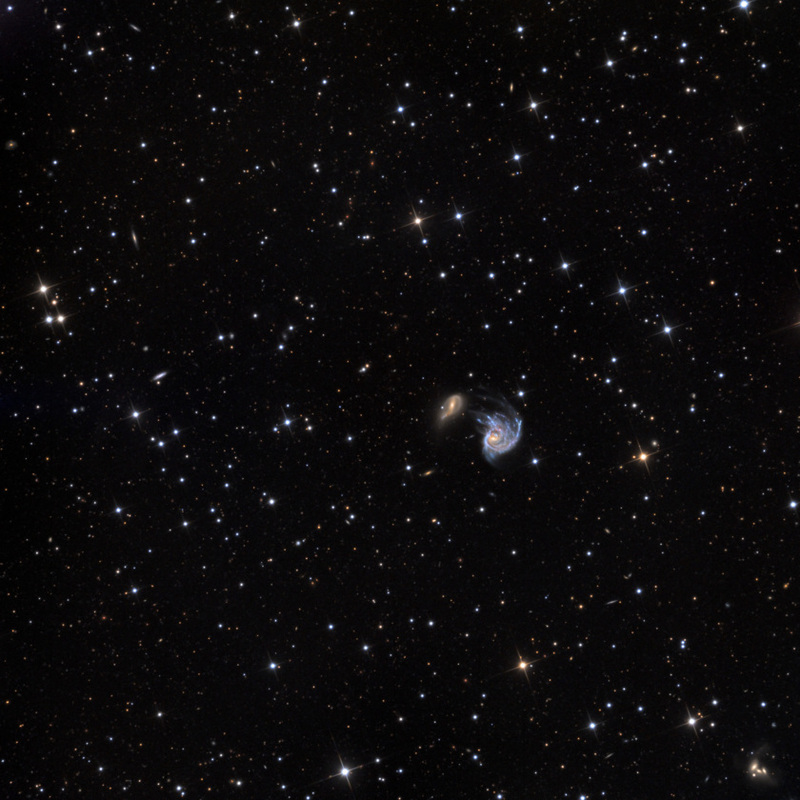 These colliding galaxies were imaged in October 2014. View additional information. Like the more famous Whirlpool galaxy, the interloper to the left pulls and severely distorts the regular spiral galaxy. To my eye it appears that the nucleus of the main galaxy has been tugged so violently that it has been displaced from its former central location based on the persistent spiral pattern that remains! This galaxy is more than 500 million light years away and it is a tiny 1 acrminute across. It is also one of the many discrepancies found in the NGC catalogue. I am labeling this object NGC 218 and PGC 2726 (the interloper) based on the most recent analysis I could find. Find more galactic crashes in the wide-field version at the bottom right corner.